Meguiar's Quick Spray Wax is engineered to wax your boat as you dry it, giving your boat a brilliant shine and added wax protection. Meguiar's Quick Spray Wax is engineered to wax your boat as you dry it, giving your boat a brilliant shine and added wax protection. Can be used on both wet and dry surfaces, Meguiar's Quick Spray wax is made to work with fiberglass, painted surfaces, clear plastic, stainless steel, and other non-porous surfaces (NOT TO BE USED WITH GLASS WINDOWS). 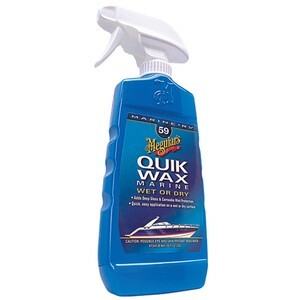 Use Meguiar's Quick Spray wax only after your boat is clean.